Participating in a clinical trial can be very rewarding. Participating is a wonderful way to play a more active role in your personal health care. Below is a brief list of benefits noted by past participants of clinical trials who have experienced the benefits first hand. •	Play an active role in their own health care. •	Gain access to new research treatments before they are widely available. •	Help others by contributing to medical research. 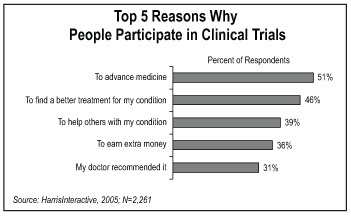 Participants have a variety of reasons to participate in clinical trials. Below is a bar graph from a recent poll of research participants and why they participate.